I am giving you fair warning, I need a little aid developing my thoughts on adventure. Consequently, there will a be a plea for your help at the end. Let me start with a little context. Cai is a little different from his classmates. It is very evident when we are skiing. 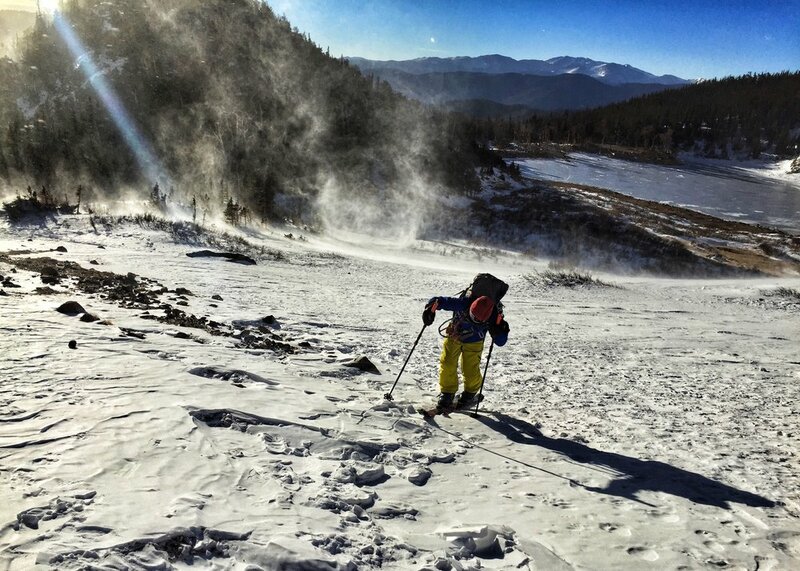 Skiing is something a lot of people do in Colorado, but the only young kids we see in the backcountry tend to be ones who come with us. Why is this a distinction? When you ski in the backcountry you are much less able to predict the conditions. One day Cai is dealing with a snowpack of thigh deep unconsolidated nastiness, on others he is being bounced around by bullet proof sastrugi, all while being buffeted by a mini cyclone. Then there are the times when he is floating amidst acres of the lightest blower powder. This is very different to the controlled environment of the ski resorts. The thing is not only does he ski differently to his friends, he also approaches life differently. He is aware of how a balanced stance allows you to meet changing circumstances. The value of working to climb a hill to have a sublime run back down is obvious to him. He looks for efficiency when he is working. He recognizes that when things are hard there is no point focusing on how miserable they are, it does not make life better. Finding the beauty in a moment however does. He knows to share the load and he knows when and how to lift the spirits of his companions. He is 12 years old. I want to be clear here, of course I am proud of my child but I do not think he is some kind of super being. I just think he has been fortunate to have spent a lot of time in nature. Even more important he has had real adventures. Experiences where we have not known what the outcome will be. Times when he has had to dig deep to reach the trail head or the sanctuary of a cabin or tent. It makes sense that uncertain outcomes are going to hone more extensive responses to a stimulus than a rote situation. Like teaching someone to roll a kayak, if you allow the participant to practice on only one side, they will learn to right their kayak in the pool very quickly but they will not be able to replicate the feat so well in moving water. Those who practice on both sides take longer to initially acquire the skill but they are more likely to perform it where it matters. This example of bilateral transfer points to why adventure may be so critical in developing other life skills. Here are the behaviors that HBR pointed to, they are no different to the ones developed at the National Outdoor Leadership School (NOLS), Outward Bound (OB) or any other Adventure Education establishment. * Set stretch goals and adopt high standards for themselves. * Work collaboratively. * Volunteer to represent the group. * Embrace change, rather than resisting It. * Take initiative. * Walk the talk. * Use good judgment. * Display personal resilience. * Give honest feedback. If I have developed any of these behaviors I did it outside, especially when the stakes were high and the Gods were not on our side. So here is the call for help. I have my ideas of the behaviors I have learned in the outdoors. It correlates with the evidence based research indicating what people learn through adventure. I aim to start collating multiple thoughts on adventure and adventure behavior. To do this I want to collect as much anecdotal context as possible. What have you learned from uncertain outcomes? What have your children learned from adventures? Why do you value it? In a world where technology is hijacking the minds and hearts of our young people I believe this is an important perspective to share. Also, please send this to anyone who appreciates the value of adventure. I look forward to hearing your thoughts and stories. You can either use the comments section or use the connect link. Thank you, I wish you and your family many more inspiring adventures.